As is frequently the case, I am embarrassed at my lack of pottery production. I should be back in the swing full time come January. For the last three months I have been doing all kinds of things, some arty and some sort-of-arty. I'll be back producing pots shortly. I have new and different ideas for pots. A good friend, Joe who runs the local library, stopped by and walked with a few treasures. The pot on the banding wheel is a wonderful piece that I was surprised didn't sell sooner. It is one of those gourd pots that has been fired five or so times and the glaze is wonderful. It was pictured on my Vasefinder gallery. And that pot that is floating - and burned out by the flash- in the foreground, was to be a Christmas present for Eric Olson. I said I would send it to him as a Christmas gift since he admired it when in Zanesville last summer. Sorry Eric, I needed the $$$ and Joe wanted it. 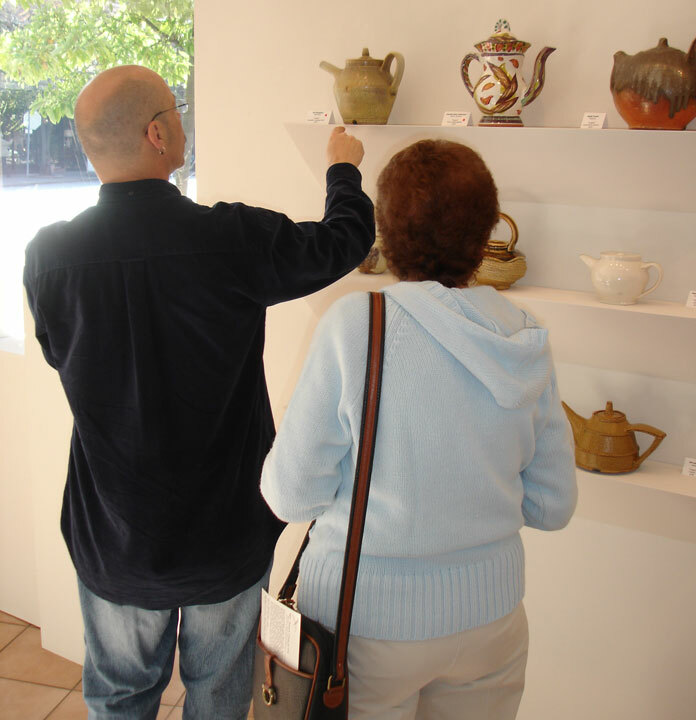 There was a teapot show at Xen Gallery. It is a wonderful show since it is a cross section of potters with an emphasis on pots meant to be used. I toured the show with a couple of friends. 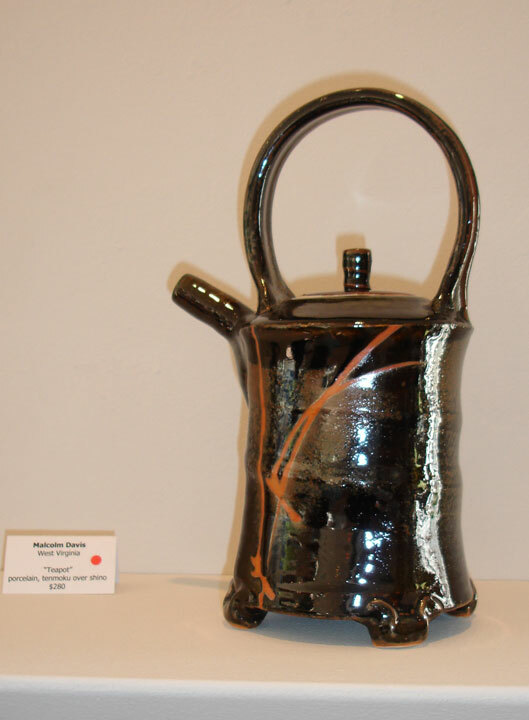 I admired this pot by Ellen Shankin, whose work I have always admired. In fact, I have ordered one of her Soup Tureens in red and she said she would make one for me. What a great piece. To top it off, the tureen is $250. Cheap, I think. I also fancied this one by Malcolm Davis. 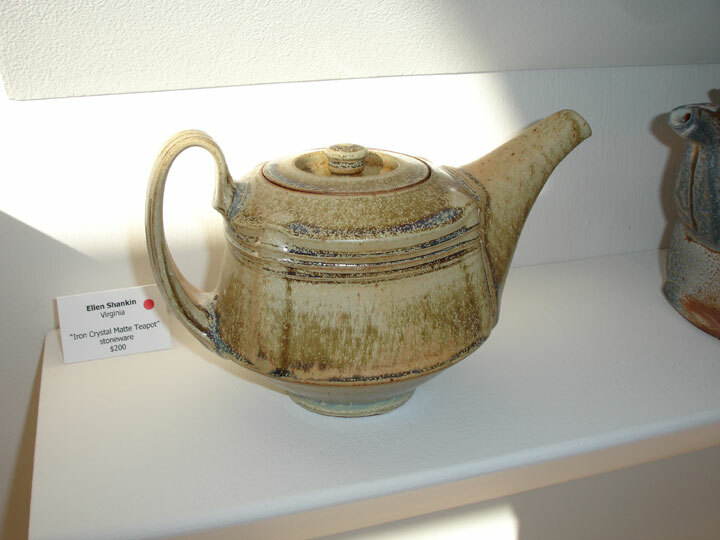 I have made only one teapot to date. But I will be making some in the near future. I am in the process of carving and painting a frame for a picture I painted. Is nearly done, but I don't have a picture handy. You will see it next update. 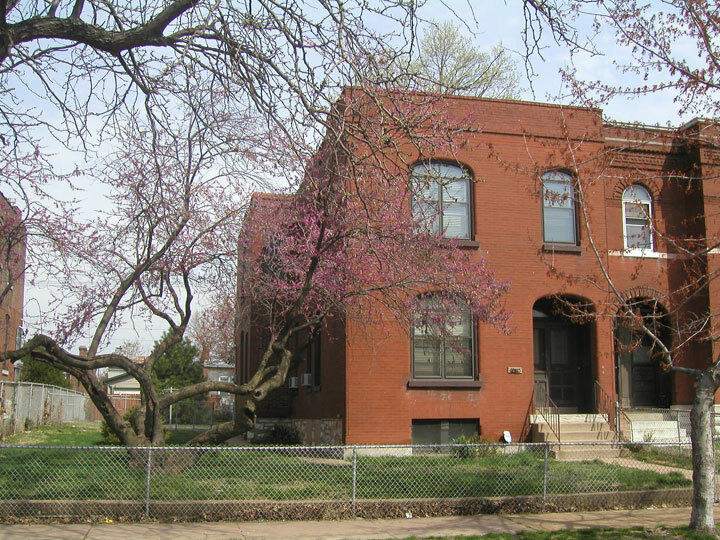 This building is an old family house not far from where I live. My family has literally owned it for 100+ years. Now I own it and it gets whatever it needs regardless of cost or energy expended. And has it been taking the energy. I am in the process of lifting the floors to level them. The six 8x8 wood posts that support the buiding's floors were rotting at the bottom because the basement concrete floors were poured around them about 40 years ago. I didn't think it would be a big job and it was not until the water line under the concrete floor started leaking. Ok, that's not too big a deal. I have fixed similar leaks perhaps six times. I go out to find the water stop box and can't find it. 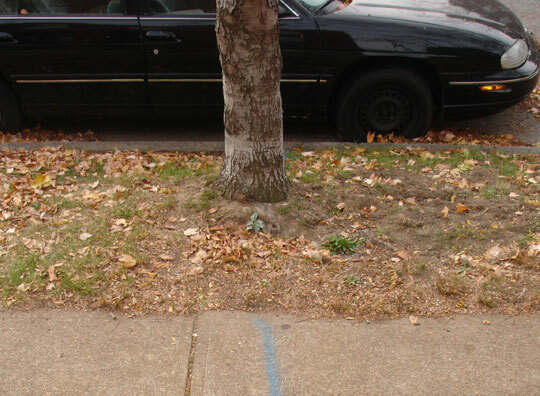 I call the city and they come out and mark it's easement location with blue paint. Yep, it is directly under a tree. So it goes. I'll tell you how it comes out. In the last few months, I put in a new bathroom and kitchen. I actually enjoy doing building work, but I would rather be making pots. I can't afford to farm out all the work and I can't get it done just as I like. So I do it myself. I do have help, luckily. Back to pottery. I had to purge the studio. 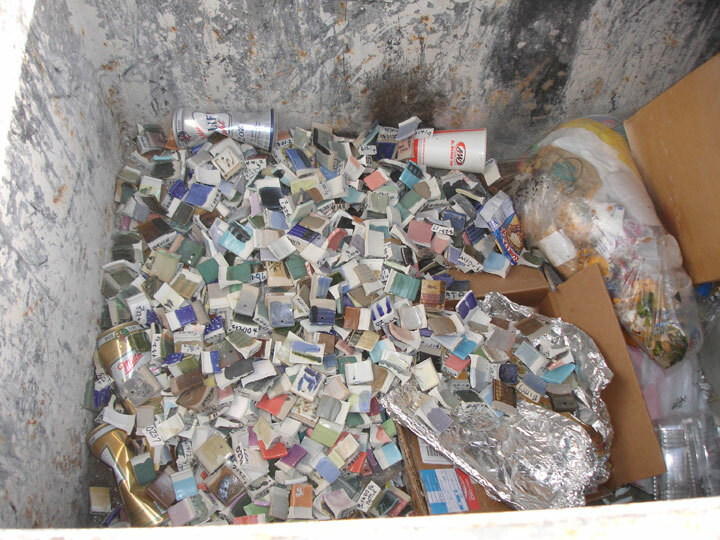 Two five galln buckets of test tiles hit the dumpster. I'll probably regret it, but so it goes. This pile of tests were all done last week. Starting to fill those empty buckets already! 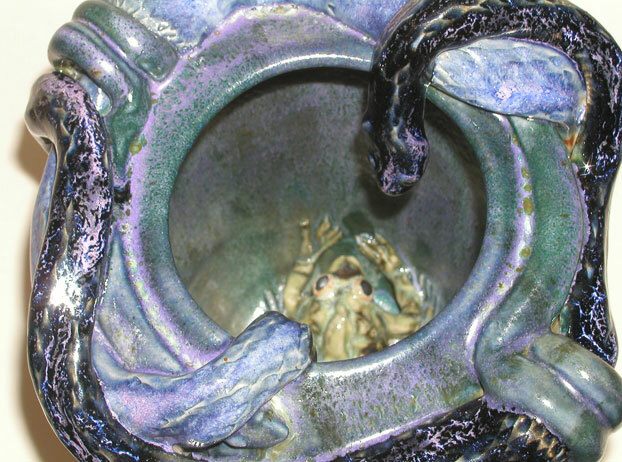 I wrote a brief article for Clay Times Magazine about one of my glazes that I call "Salvation." It is this purply glaze I put over pots I really want to change. You have probably seen it on this web site many times. One of you owns this pot. And one of you has this one as well. 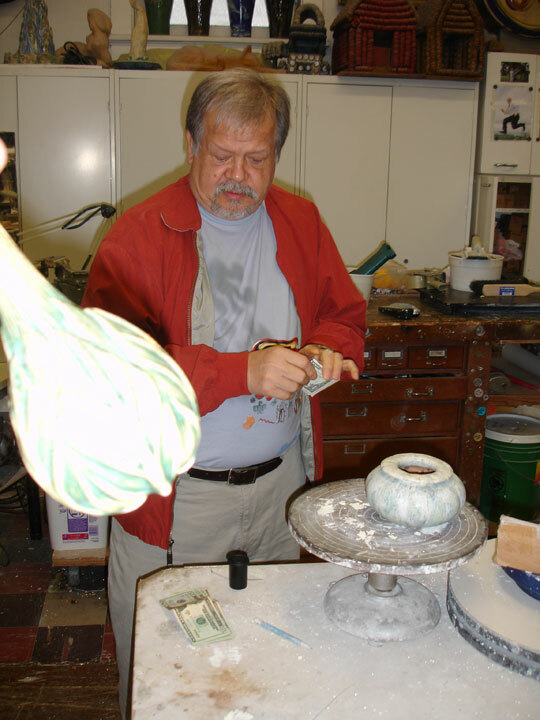 I was asked by many potters to reformulate to glaze for firing it to a lower temperature. Apparently, many potters need "Salvation!" These are the results and the next two pictures were sent to the magazine. This Wisteria pot is an example of using the Salvation glaze in a different way and use it with colors to glaze entire pots. This brief line of Wisteria pots was killer. I took 10 of them to Zanesville around 2001 and I sold only ONE!!!! I was shocked. I thought they were my best effort of the year. People have since come to their senses and have asked to buy them. My friend, Tim Miller, sent me these. Inspiration for gourd pots. I can't wait to make more gourds. Lately I had a handful of folks writing and asking about more gourds. I don't have any at the moment, but I will in the spring. 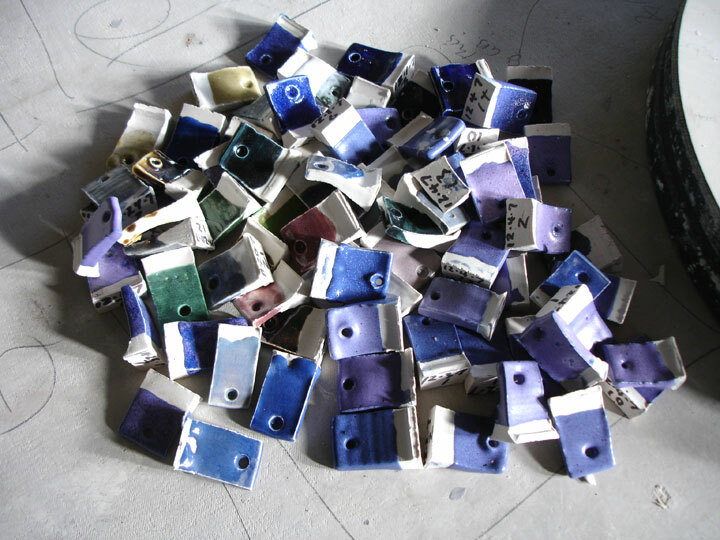 Because of my three month break from clay, I have many, many clear ideas of how to proceed. Wait till you see what I make next.